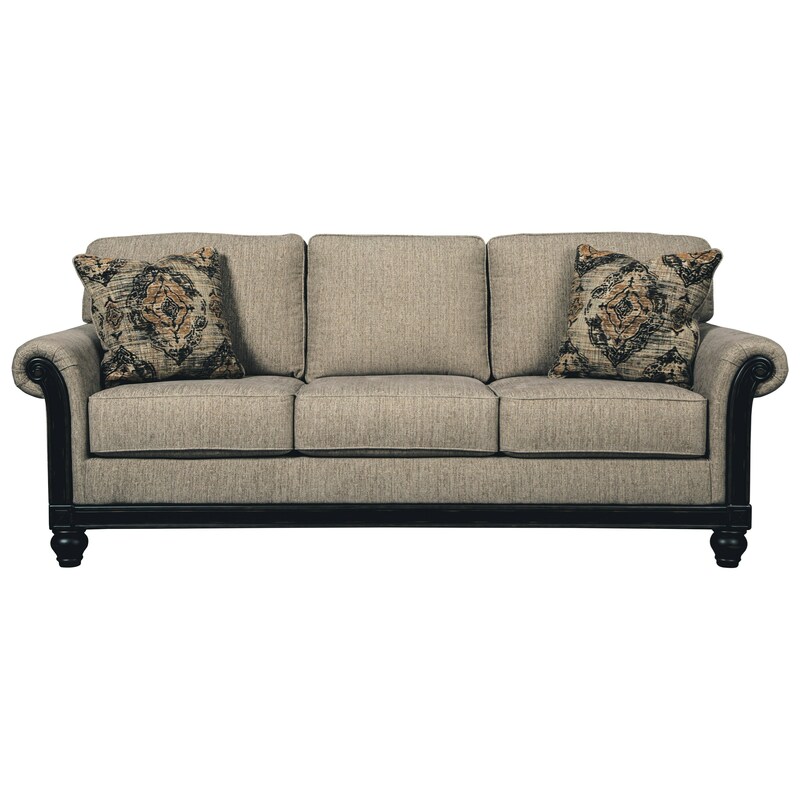 Gently distressed dark showood trim at the front the rolled arms and along the base rail contrast beautifully with the taupe fabric on this sofa. Two accent pillows with a vintage-inspired medallion pattern on one side and turned feet complete the sofa. It offers classic style to your home, while easily fitting into modern lifestyles. The Blackwood Transitional Sofa with Rolled Arms & Showood Trim in Dark Finish by Signature Design by Ashley at Michael's Furniture Warehouse in the San Fernando & Los Angeles area. Product availability may vary. Contact us for the most current availability on this product. 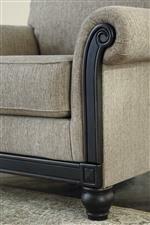 A sophisticated design style that maintains a livable feel comes together in this upholstery collection. Bun feet and showood trim on the base rail and at the front of the rolled arms are finished in a rub-through dark finish. The Blackwood collection is a great option if you are looking for Relaxed Vintage Transitional furniture in the San Fernando & Los Angeles area. Browse other items in the Blackwood collection from Michael's Furniture Warehouse in the San Fernando & Los Angeles area.